The Add Linear Events widget allows Event Editor to add events to redlines. It provides them the ability to characterize the roadway with the appropriate attributes before the LRS editor has added or fixed the route in the LRS, so their workflow is not impeded by having an incorrect LRS route based on current information. For more information on redlines, see Redlining a route. This functionality is only available when you've included the redline layer in the map service configured against Event Editor. 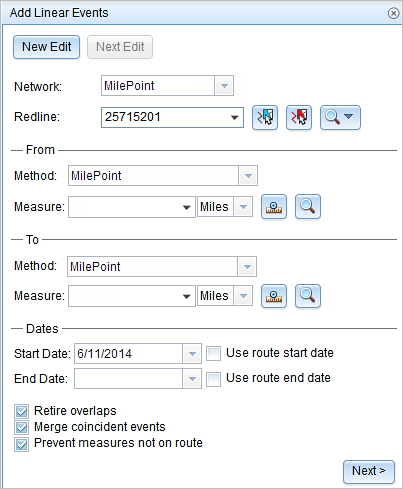 For more information on how to deploy redlines in Event Editor, see Deploying redline routes. 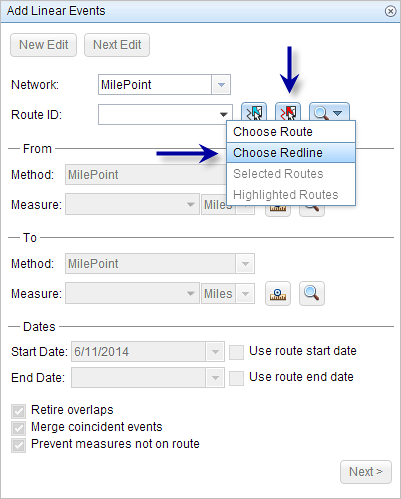 You can save events on redlines that have Create Route or Reverse Route activity types. For the reverse route redline, the measure provided upon storage will be translated to the measures required to get the events to locate at the same location before the reverse. You can use the following steps to add linear events using redlines. A redline with the following attributes is used for this example. Click the Select a Redline on the Map button to select the redline from the map. You can also click the Route ID drop-down arrow and click Choose Redline, then type the route ID for which the new event measures will be provided. In the From section, click the Method drop-down arrow and use one of the following methods to choose the from measure value for the events. 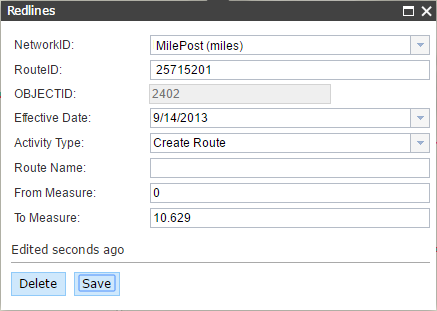 Choose the network (MilePoint in this case) to enter the from measure value for a single redline. Choose a reference offset method to enter the from measure value using a reference offset. 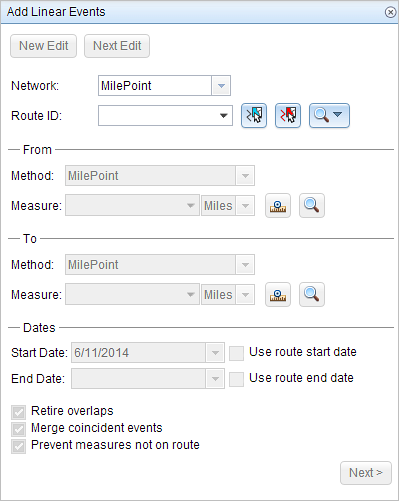 Click the Select From Measure on the Map button and choose the from measure value along the route on the map. 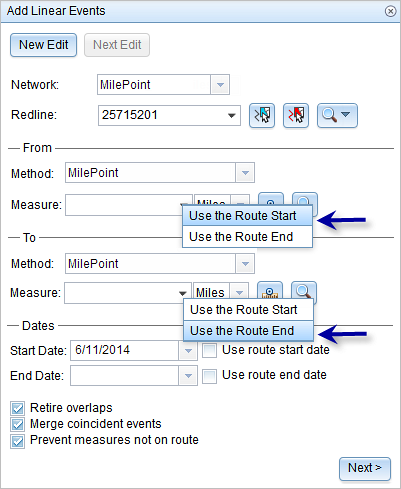 Click the Measure drop-down arrow and choose either Use the Route Start or Use the Route End as the from measure value for the event. In the To section, click the Method drop-down arrow and use one of the following methods to choose the to measure value for the events. Choose the network (MilePoint in this case) to enter the to measure value for a single redline. Choose a reference offset method to enter the to measure value using a reference offset. Checking the Go to the next measure upon save check box results in prepopulating the from measure value using the to measure value of the present section to continue the event creation process. For example, this will occur if events are created on the route using a from measure value of 0 miles and a to measure value of 0.289 miles. If you click Save, using this option checked on the Attribute Set tab, the Add Linear Events widget is prepopulated with the value of 0.289 miles as the from measure value for the new events.